Nothing less than a victory will matter for the India as they take on hosts New Zealand at the at Eden Park in Auckland on Friday. An adverse result will conclusively seal the three-match ODI series in favour of the hosts. The Rohit Sharma-led Men in Blue will also play to salvage their dented pride having bolted around the part in Wellington on Wednesday when India suffered the biggest ever defeat in their T20I history. The Kiwis had reigned supreme in all department of the games. Except for a better application, discipline and commitment the touring party might not get much to change for as the new ball attack looks blunt without Jaspreet Bumrah and Mohammad Shami. Bhubaneswar Kumar is found wanting to reproduce his best. Sitting out of the XI had affected his rhythm. No practice can sharpen the skills better than the real match situations. The think-tank will be forced to make some changes even as options are limited. Khaleel Ahmed might have to make room for Siddharth Kaul or Mohammad Siraj. Kuldeep Yadav will be another good option, but at whose cost will be interesting to find. The seasoned trio of Rohit Sharma, Shikhar Dhawan and MS Dhoni will have to deliver in the batting to offer a strong foundation for the options being explored for the bigger challenges ahead. The Squads: India (from): Rohit Sharma(c), Shikhar Dhawan, Rishabh Pant, Dinesh Karthik, Kedar Jadhav, MS Dhoni, Krunal Pandya, Kuldeep Yadav, Yuzvendra Chahal, Bhuvneshwar Kumar, Siddarth Kaul, Khaleel Ahmed, Shubman Gill, Vijay Shankar, Hardik Pandya, Mohammad Siraj. New Zealand (from): Kane Williamson(c), Doug Bracewell, Colin de Grandhomme, Lockie Ferguson, Scott Kuggeleijn, Colin Munro, Daryl Mitchell, Mitchell Santner, Tim Seifert, Ish Sodhi, Tim Southee, Ross Taylor, Blair Tickner, James Neesham. 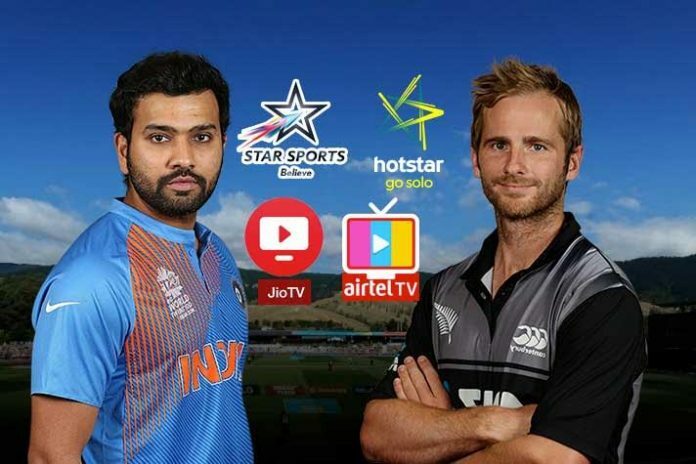 Star Sports will broadcast the match on Star Sports 1, Star Sports 1 HD, Star Sports 1 Hindi, Star Sports 1 Hindi HD, Star Sports 1 Tamil, Star Sports 1 Telugu and Star Sports 1 Kannada. While they will also live stream all games on their OTT platform Hotstar. The Airtel and Jio mobile network users also have the option of catching the live action on JioTV and AirtelTV while on the move. The game will start at 11:30 am IST.